The days are getting shorter and the mercury is starting to dip. That’s right, winter is around the corner and along with it, all those nasty coughs and colds that come as part of the package. But don’t fear! It’s easier than you think to stay healthy over the chilly months. We look at some of the best ways to avoid getting sick, and if you happen to fall ill, we’ll also show you how best to minimize the impact. The cold and flu season is fast approaching, but that doesn’t mean that you and your family need to succumb to days or weeks of coughing, aches and misery. By following a few simple steps you can keep healthy and avoid nasty colds and illnesses this winter. Staying healthy is a combination of nutrition, exercise and careful hygiene. Consuming plenty of fresh fruits and vegetables, whole grains, lean proteins and low-fat dairy products is important, but to fully develop your immune system it is important to combine a healthy diet with moderate exercise. Not only does this help your body to not get a cold in the first place, but a well developed immune system is better at fighting illness and infection, meaning that if you do contract a cold, you can recover from it more quickly. The primary means of virus transference is through contact with people that are already infected with a virus. Wherever possible, avoid areas where other people may be sick. Public transport, airplanes and the workplace are often places where you need to share confined spaces with multiple people, and when you’re breathing in the same air as they are, it’s easy to contract any number of viruses. If you can avoid it, try to minimize the amount of time you spend in these types of spaces. 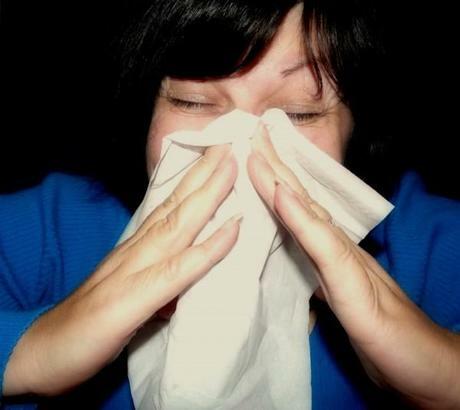 Viruses and colds take hold far easier in the human body when the immune system is worn down. One of the most important steps in ensuring your body is functioning at full capacity is to eight hours of sleep per night. A study published in the Archives of Internal Medicine discovered that people who slept eight hours or more per night were three times less susceptible to catch a cold than those that slept for less than seven hours per night. So be sure to rest up and you’ll be better prepared to fight off any nasties that come your way. If you didn’t have enough reasons to kick that nasty habit, smoking cigarettes makes you far more likely to develop a cold. Cigarette smoke dries out and paralyzes the small hairs (called cilia) that line the human throat. This prevents them from being able to push virus particles out and away from the lining of the throat. Not only does smoking make you more likely to catch a cold, but it can make the recovery time longer as smoking damages cells in the lungs as well. Stress has been shown to have a negative influence on the human immune system and to make you more susceptible to illness. Numerous medical studies have discovered that people in high stress vocations such as astronauts, students and athletes have higher incidences of upper respiratory infection than other groups, and one such study found that healthy adults exposed to a cold virus were twice as likely to get sick if they reported being under stress. By finding constructive ways to combat stress such as yoga or meditation, individuals are far more likely to be able to fight stress effectively and avoid illness. If you find it difficult to get all the nutrition you require through the food you eat, you may consider taking supplements. Vitamins A, B, C and E have been shown to boost immunity, so if you aren’t able to combine foods into your regular diet that contain high amounts of these vitamins, you should consider taking supplements to make sure you keep your immune system functioning at its best. Colds and viruses thrive under certain conditions, for example when there is low humidity and the weather is cold. Cold weather can also make your nasal passage lining drier and more vulnerable to viral infection. Dress appropriately for the weather in order to keep warm and you’ll make yourself far less susceptible to colds and viruses. Few people relish the prospect of having a shot in the arm, but as with most things, an ounce of prevention is better than a pound of cure. The flu can be prevented, or at least its influence drastically lessened through vaccinations. People with a compromised immune system, including the very young and the elderly, are often more susceptible to illness so it is especially important for people in these categories to be immunized. The second you feel the beginnings of a cold, take immediate steps to halt its progress. The longer a virus is allowed time to take hold, the more time it can take to shake its grip. If you do happen to become sick it is important to make sure you allow your body the time to recuperate. By rushing back to work before you are healthy again, you’re not only risking the health of those around you but you’re also denying your body the time it needs to recuperate. When your immune system is compromised, it needs time to rally and combat the germs in your system. So take a couple of those sick days and use them as they were intended. It is important to keep your hands clean; be sure to cover your nose and mouth when sneezing and if possible, use a handkerchief or tissue. Be sure to dispose of tissues promptly, wash handkerchiefs in hot water, and be sure to wash your hands frequently. By following these simple steps you can avoid contracting viruses but also inhibit the spread of any germs to others. The old adage that chicken soup is the best remedy may have some merits. A lab study conducted at University of Nebraska Medical Centre tested the age old theory that a hearty broth of chicken soup can prevent a cold’s miserable side effects and came up with some intriguing conclusions. Homemade soup was shown to inhibit movement of white blood cells called neutrophils by 75 percent, which researchers suggest can translate into a reduction in cold symptoms.